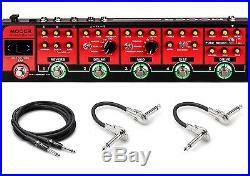 New Mooer Red Truck Multi Effect Pedal. This item is new, in box! Mooer does not include a power supply with this pedal. The Mooer Red Truck is one of the most full-featured effects strip on the market. Featuring several effects modules within one unit, this is designed for players who prefer the simplicity of single effects over multi-effects and want a portable solution for rehearsals, gigs, or where carrying a lot of gear is an issue. The Red Truck can also be used as the heart of a larger pedal board, with the effects loop allowing for the expansion of the unit. The all analogue Boost, Overdrive and Distortion circuits provide lush warm tones. A fully comprehensive collection of high quality digital effects including Modulations, Delays and Reverbs with Tap tempo control provide spacious and ambient atmosphere via the stereo outputs. A highly visible and precise tuner will make sure you are always in tune on stage. All the parameters and functions are laid out in front of you just like a traditional pedal board. Easy to view and adjust on the fly. The Red Truck is compact and easy to transport with the tidy soft-case we have included in the box. No matter where in the world you are going to play and what you need to connect to you can always take a fully professional pedal effects rig with you with ease. 6 effects pedals in 1 - Boost, Overdrive, Distortion, Modulation, Delay, Reverb. Full featured controls for each effect. Built in precision guitar tuner. Tap tempo with dotted 8th subdivision for delay. Integrated effects loop for connecting external pedals or 4 cable method connection with an amplifier. Dedicated direct output with speaker simulation for connection to a mixing desk, computer or headphones. Includes a carry case for easy transportation. Operating Modes Live / Preset. Effects (6 + tuner) Pure Boost, Drive, Distortion, Mod, Delay, Reverb + Tuner. Power Supply DC 9V, 300ma min center negative. Dimensions (HxWxD) 370 mm x 96 mm x 51 mm. The item "New Mooer Red Truck Multi Effects Strip Guitar pedal with Case" is in sale since Thursday, July 6, 2017.